GEORGIA is a new, pop-up art space located in the alley behind 952 Mariposa Street in Denver’s La Alma neighborhood. 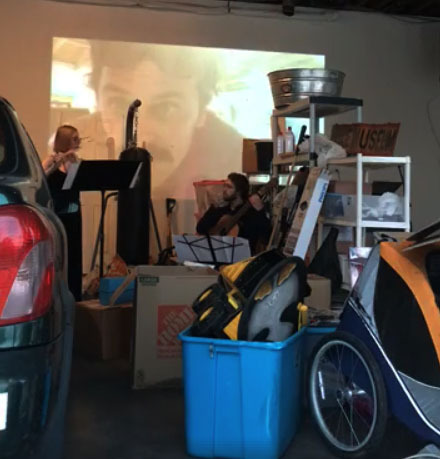 Housed in Sommer Browning’s one-and-a-quarter car garage, GEORGIA aims to blur space and purpose. Coinciding with the founding of GEORGIA, Counterpath (7935 East 14th Ave. in Denver) is excited to host 952 Mariposa, an exhibit of the gallery’s previous contents. Running parallel to GEORGIA’s first show—Future Bodies, a collection of Joshua Ware’s large-scale collages—on display at Counterpath will be the actual contents (boxes of books, broken air conditioners, cobwebbed exercise equipment, a car) of Browning’s garage before it was reconfigured. The show at Counterpath, a gallery in the East Colfax neighborhood that was itself formerly a garage, works to subvert notions of intention, found art, and privacy, exploring a feedback loop between a DIY accumulation of aesthetic value and the supposed abrogation of that value in a slightly more formalized gallery setting. Opening receptions (livestreamed) at both venues will take place Friday, September 8, 2017, 6-11pm. The Counterpath reception will feature the Flinchum/Herring Duo on flute and guitar. Click here for other events at GEORGIA (including an opening-reception performance by Path of Totality). Both exhibits are on view through Sunday, September 10, 2017, and free and open to the public. RSVP to the Counterpath event. RSVP to the event at GEORGIA. 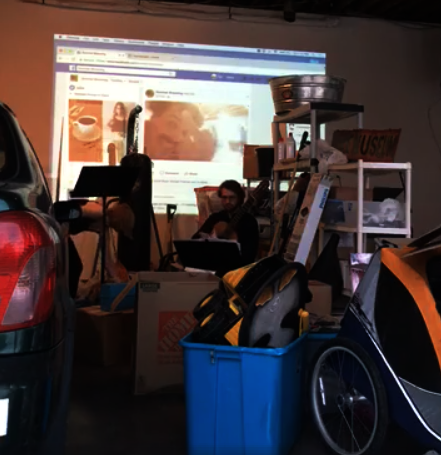 Live feed from GEORGIA is visible on the back wall at Counterpath (also accessible at Sommer Browning’s Facebook page). The Flinchum/Herring Duo is a Denver-based group with musical versatility and dynamical passion as a group and as soloists. First starting at the Lamont School of Music in 2016, the duo has been able to perform a variety of repertoire from the classical standards to tango, contemporary, and pop styles. Highlights include the U.S. premiere of “Song Without Words” by Japanese composer Noriyasu Tanaka in February 2017. Catherine Flinchum is an active flutist with a performing career in the Atlanta, GA and Denver, CO areas. She holds a Bachelor of Music degree from Kennesaw State University and a Master of Music degree from the University of Denver. Her teachers include Christina Smith of the Atlanta Symphony Orchestra, Cecilia Piehl-Price, and Anna Hobgood. She is currently studying with Julie Thornton of the Colorado Symphony. Guitartist and composer Jeff Herring is an active musician in the Denver, CO area. He received his Bachelor of Music degree at Florida State University and currently is pursuing his Master of Music at the Lamont School of Music under Jonathan Leathwood.